My Say! Youth Art event brought 100 young people and youth leaders from all over Northern Ireland and the border counties together to have their say on Northern Ireland’s segregated communities and education system. The young people used drama, graffiti, murals, DJing and poetry to express and articulate their views about segregation. The youth worked with leading National and International artists to create artwork which conveyed their opinions. The conference ended with a showcase where the results were shown to an audience of politicians and decision makers. WATCH: My Say!! 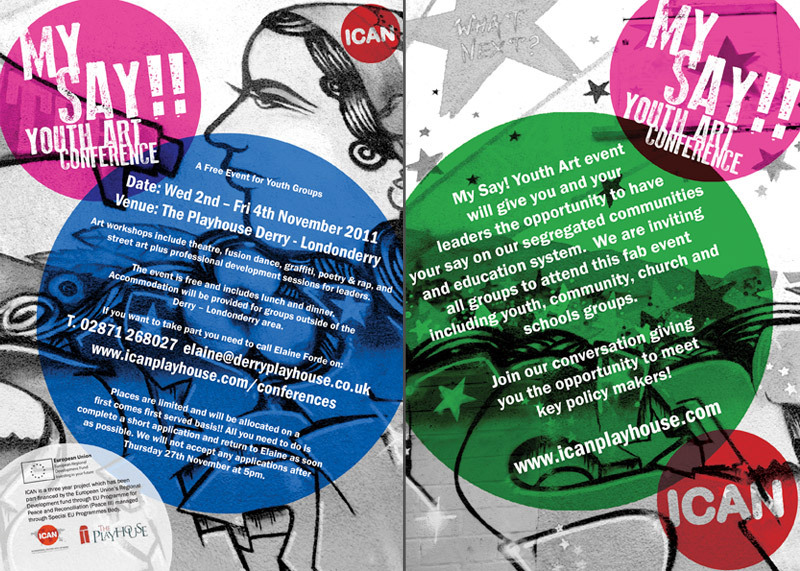 Youth Art Conference WATCH: My Say!! Youth Art Conference. Film for theatre piece by artist Sara Greavu PDF: My Say! Fllier PDF: My Say! Event info & schedule PDF: My Say! Registration Form PDF PDF: My Say! Registration Form Word Doc.